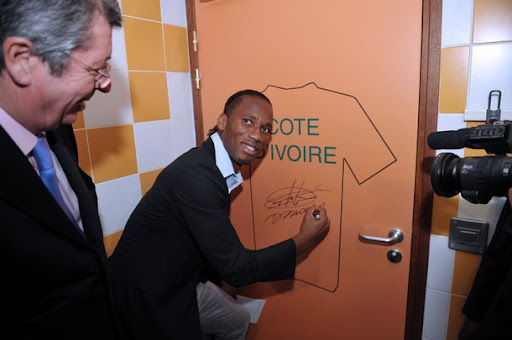 Didier Drogba was back on Wednesday at Levallois Sporting Club, in a north-western suburb of Paris, for the official renaming of the stadium – as the Stade Didier Drogba. When Drogba joined Chelsea from Olympique Marseille for £24 million in 2004, Levallois received a percentage of the fee, which equated to about £600,000. It allowed the fourth-tier club to upgrade the facility to its present gleaming levels. The pitch had been relaid with synthetic turf and there were new indoor tennis courts, an athletics track, two squash courts and smart clubhouse. Speaking at the inauguration of the new arena, Drogba said: "This is a great moment in my life. From now on, the children from this district are going to say: 'I'm going to play at the Stade Didier Drogba,' and that's enormous. "It's more than flattering, it's historic. Having a stadium in France named after a footballer from the Ivory Coast, even if I'm proud of my France-Ivory Coast background, is a great proof of integration. "The four years I spent at Levallois were my most important ones because this was and still is an amateur club and this is where you learn all your values, like sharing and solidarity. "When I heard that Levallois had a percentage of my transfer money, which helped the club to survive, I was really happy. "It's amazing to see what they've built so that kids can come here and practise instead of being on the street and doing bad things."